Mister Rogers arrives with the pieces needed to make a model car. In the kitchen, he uses glue to assemble the body of the car before Mr. McFeely arrives with the wheels and helps finish the car. Mr. McFeely also shares an item he will be delivering to Lady Elaine Fairchilde -- the keys from a small piano. In the Neighborhood of Make-Believe, Mr. McFeely delivers the piano part to Lady Elaine at the Museum-Go-Round where she has covered the outside of the museum with signs which read "Pianos." 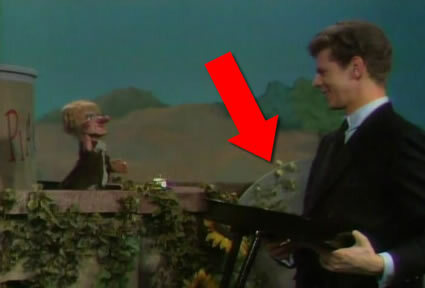 At the clock, Daniel Striped Tiger is working on another part for Lady Elaine when Van Cliburn arrives to pick up the part. He also retrieves parts from Henrietta Pussycat and X the Owl and takes them all to Lady Elaine who is putting together a surprise piano for Mr. Cliburn. Grateful for the gift, Mr. Cliburn compliments Lady Elaine on her generosity and her hard work. Back at the house, Mister Rogers has been playing with the toy car and one of the wheels has broken. Realizing that wishing will not fix the car, Mister Rogers takes it to the kitchen where he uses glue to repair the wheel. He concludes by singing I'd Like To Be Just Like Mom and Dad. With the toy car finished, You've Got To Do It plays briefly in the background. Despite the fact that the Platypus family had moved to Make-Believe by this point and their mound had replaced the Frogg pond, the Frogg pond can be seen behind Mr. Cliburn as he stands outside the Museum-Go-Round.